So, after a late Saturday night catching up with friends, it was a little hard getting out to feed the animals this morning. Nevertheless, I made it down to the yard by 7:30 and went through my normal routine of feeding and checking on everyone. It takes about half an hour and I enjoy the quiet time with the stock. As I was walking back to the house, I heard Barabas’ back foot thump. As resident buck rabbit, he alerts everyone to potential threats – and he’s good! He’s let’s me know about everything from strange people in the yard to thunderstorms ages before they arrive. 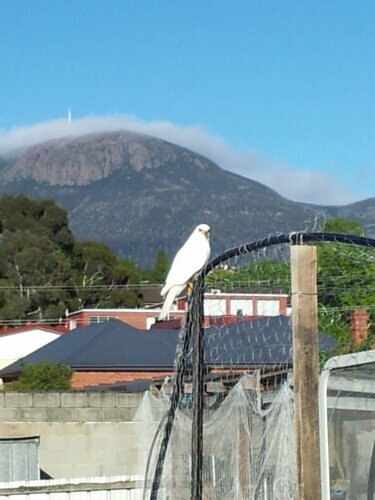 I saw the chickens had run back into the coop, and on the top bar of “Frankenhutch” sat a gorgeous White Goshawk. No wonder everyone was spooked! These magnificent native birds are the smallest raptors in Tasmania and, although their natural habitat has declined, they’re not uncommon around built up areas, where they’ll hunt rodents, chickens, rabbits and smaller birds. As our visitor flew off, I was grateful to have seen such a magnificent animal in my yard – but even more grateful that my chickens are in a fully enclosed yard. I wonder if there’ll be any eggs today? Previous Something to Cheer About Next “Jax” Update – This Woman’s Got It!